Michelle Elkins is a regular contributor to the Sicily Airport Guide, which provides the best rates on [http://www.sicily-airport-guide.com/palermo-airport-car-hire.htm]Palermo Airport car hire and information on everything from [http://www.sicily-airport-guide.com/palermo-airport-transfers.htm]Palermo Airport transfers to Palermo Weather. If you are thinking about going for a trip to South Italy, maybe you would like to know where to find stunning beaches to relax and sunbathe far from the city noises and routine. Before going, discover the 5 best beaches in Sicily you shouldn't miss for any reason. Are you much more into sandy shores? Or do you prefer rocky beaches? Check the detailed list we've prepared for you and find out your ideal beach in Sicily! The good weather, the stunning seascapes and the warm people make Sicily the perfect destination for pleasant and relaxing holidays. All around the island, there are a lot of heavenly spots, but with this little guide you'll be sure to choose among the best places to stay in Sicily. Opt for the place that better matches with your ideal holiday and enjoy your stay! Nature lovers get ready to have a trip around the best landscapes ever. If you want to enjoy the wonders of both the sea and the mountain, one of the best places to stay in Sicily is Cefal�. This small seaside village is at about 10 miles from the park of Madonie where you can go trekking or birdwatching, among the lush paths of the reserve. Have a bath among the stacks in the bay of Cefal�, just below the promontory of the Rocca, or enjoy the naturist beach enclosed in the gorges of Tiberio, near San Mauro Castelverde. If you are interested in history and art, the best places to stay in Sicily are those in the surroundings of Syracuse. The whole area has a lot of Greek archaeological sites and many examples of Baroque buildings. Have a walk around the ancient amphitheatre in Syracuse and visit the Cathedral in Noto, inscribed on the World Heritage List of UNESCO, and take a picture to the famous 'Orecchio di Dioniso' (Dionysus's ear) in Ortigia. If you love chocolate, do not miss Modica, near the southernmost point in the island. You will enjoy art while trying some of the finest chocolate in Italy. Sicily is really famous also for its tasty culinary art. You can have really delightful food experience all around the island, but probably one of the best places to stay in Sicily where you can try several kinds of street food is Palermo. Taste panelle, crocch�, stigghiola, milza and arancine, and don't forget to have also a sweet cannolo with ricotta cheese and chocolate before leaving. Let the charm of food street attract you or choose one of the several food and wine tours organized by many associations that work for the promotion of local products and traditional cuisine. Try to spend a day in a real Sicilian atmosphere, surrounded by warm people during one of the several festivals. It is said that Rome wasn't built in a day. The magnificent structures as well as the ruins speak volumes of its glorious history. It has the richest and the fullest history evidenced by anyone so far. It is colorful and the most appealing of all travel destinations. This is one place where the past and the present go hand in hand. Here you can try to follow the tourist's path or try and go off the track, if you are brave enough to. Either way, Rome is going to amaze and surprise you. This is one city which has plenty to offer, but its beauty has been blurred by the passing time. Rome is one of the most popular tourist destinations in Italy. It is home to several historical monuments some of which can be seen for free while others require cards and passes. Most of these ancient monuments are located in the city's historic centre and so there are several places that you can visit in a single day. Even if you don't have time for an in-depth look, you will find walking past them an incredible experience. Over the past few years, some of these monuments have been renovated to make them more user-friendly. 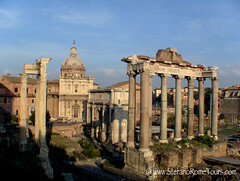 Here are just some of the historical monuments that you may wish to see while in Rome.